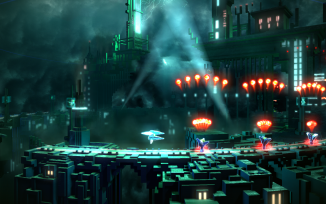 Veteran Finnish code aces Housemarque helped launch a new generation with their PS4 (then) exclusive, Resogun. Taking its cues from classics Defender, Drop Zone and Datastorm – as well as a few from Housmarque’s previous gen banger, Super Stardust HD – Resogun pushed the PS4’s voxel-pumping power to the limit. Leon, Josh, Karl and community member Camille Rousseau get deep into aesthetics, mechanics and score chasing – with particular emphasis on Camille’s 100+ hours spent in survival mode! Cane and Rinse 334 was edited by Sean O'Brien. Woo! Shout out to KSub, great contributions and a quality show. I wasn't into shmups when I played the few hours I spent with this but this ep has made me redownload it so I'll be sure to put a bit more in and share a few thoughts. Woo! Shout out to KSub, great contributions and a quality show. Hey, thanks man. I was a bit nervous during the recording and I think I messed up some of my explanations but I'm glad you got something out of it. Coincidentally enough, I finally broke my Survival highscore earlier today! The score isn't particularly high when compared to the top of the leaderboard, but I still feel pretty good about it. Any improvement on this would be a matter of raw endurance rather than skill, I think. PS: Courtesy of Mrs. Aran, of course. I'm about 40 min into the podcast, hopefully get chance to finish it later. Enjoying it so far. Resogun is a big part of why I picked up a PS4 and is probably the only respectable platinum I've got on there. I love Housemarque, responsible for some of my favourite games over the last 2 console generations. I haven't played for a while, but the podcast has given me the urge to fire it up and see where my scores are at. I did play it quite a bit on the vita too, should try to get back to that as well. Excellent job on the podcast, KSubzero! Had a three hour drive today so got through the August Patreon cast and this one. Excellent show, and well done Ksub on your appearance, it was a great listen! I appreciate the kind words, guys. Great show! You wouldn’t know it was your debut Ksub. Really great stuff! Well, I've given it a good go today, about two or three times hours and while I can feel myself getting a bit better at it, the feeling I get when playing reminds me of nicotine cravings. It's the constant anxiety caused by losing the multiplier and chasing off screen enemies or - worse - not having any enemies at all in the peripheral vision and just gambling on where they'll spawn. I'm sure there must be a way of playing the spawning algorithms but the number of times I use full boost out of desperation and then see enemies appear right where I first came from makes me feel a little too much like I'm being trolled. Arcade Mode feels like that almost all the time, with the peak moments where the screen is packed and I'm dodging and boosting and bombing coming much too infrequently for me. It feels like I'm constantly chasing and hunting for something to shoot. I much prefer the danmaku sense of being overwhelmed and crushed, only to wriggle my way out leaving devastation in my wake, feeling like a king. Survival mode is therefore much more up my street, and I'll keep going with that. It's the constant anxiety caused by losing the multiplier and chasing off screen enemies or - worse - not having any enemies at all in the peripheral vision and just gambling on where they'll spawn. I take it you share my misgivings towards the multiplier that I expressed during the show, then? It just feels... off. Not by a lot, mind you. But like it's sometimes rigged to make you lose by delaying the next enemy wave by half a second or so. Very frustrating stuff. Oh, and if you're gonna play Survival now, would you mind adding me on PSN? Your profile is currently set to "antisocial old goat no messages no friends no joy no nothing"-mode. Absolutely share your experience and I think it's a fair observation. You shouldn't have to use up a bomb or boost purely because the game is so stingy, and in fact even if you do, there's no guarantee that the next wave will spawn in good time. I like it but it's ever so slightly ungenerous, which is the opposite of what I want from a shmup. It's just a different kind of game, really, to the stuff I like not least because it's on a horizontal plane. And sorry to be so apparently hermit-like and I hope it's doesn't come across as rude but I'm not even friends with my brothers on there! It's a fairly dull story involving work circumstances but I hope you'll take me at my word that I'm 'equal opportunities' anti-social! I would be delighted to be Switch friends though when the time comes, I have a lot more faith in their set-up. Of course, no problem! I just wanted to have someone other than Leon to compare scores with, although I'm sure that you'll keep us updated in case you end up catching the Survival bug. PS: I hope you catch the Survival bug. Misery loves company. My scores are pretty pitiful mainly because my friends aren’t/werent into resogun. Might give it another whirl.